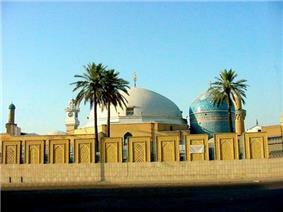 Nur ad-Dīn Abd ar-Rahmān Jāmī (Persian: نورالدین عبدالرحمن جامی‎‎) also known as Mawlanā Nūr al-Dīn 'Abd al-Rahmān or Abd-Al-Rahmān Nur-Al-Din Muhammad Dashti, or simply as Jami or DJāmī and in Turkey as Molla Cami (August 18, 1414 – November 17, 1492), is known for his achievements as a scholar, mystic, writer, composer of numerous lyrics and idylls, historian, and the greatest Sufi poets of the 15th century. 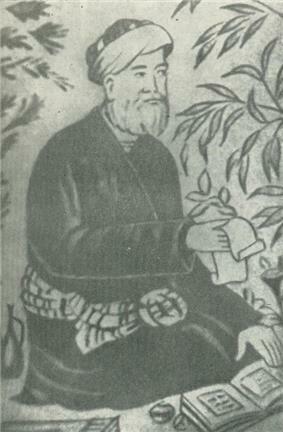 Jami was primarily an outstanding poet-theologian of the school of Ibn Arabi and a prominent Khwājagānī Sũfī. He was recognized for his eloquent tongue and ready at repartee who analyzed the idea of the metaphysics of mercy. Among his famous poetical works are Haft Awrang, Tuhfat al-Ahrar, Layla wa -Majnun, Fatihat al-Shabab, Lawa'ih, Al-Durrah al-Fakhirah. Jami was born in Jam, (modern Ghor Province, Afghanistan). However, an article in the Encyclopedia Iranica claims that Jami was born in the hamlet of Ḵarjerd, in Khorasan. Previously his father Nizām al-Dīn Ahmad b. Shams al-Dīn Muhammad had come from Dasht, a small town in the district of Isfahan. A few years after his birth, his family migrated to the cultural city of Herat where he was able to study Peripateticism, mathematics, Arabic literature, natural sciences, language, logic, rhetoric and Islamic philosophy at the Nizamiyyah University of Herat. His father became his first teacher and mentor, who was also a Sufi. While in Herat, Jami was a central role and function of the Timurid court, involved in the politics, economics, philosophy, religion, and Persian culture. Afterward he went to Samarkand, the most important center of scientific studies in the Muslim world and completed his studies there. He was a famous Sufi, and a follower of the Naqshbandi Sufi Order. He embarked on a pilgrimage that greatly enhanced his reputation and further solidified his importance through the Persian world. Jami had a brother called Molana Mohammad, who was, apparently a learned man and a master in music, and Jami has a poem lamenting his death. Jami fathered four sons, but three of them died before reaching their first year. 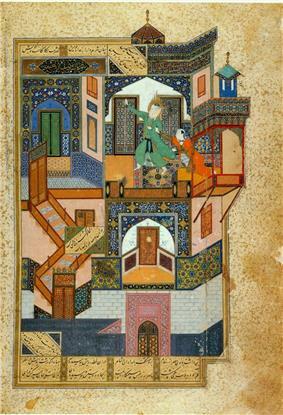 The surviving son was called Zia-ol-din Yusef and Jami wrote his Baharestan for this son. Aftandil Erkinov. "Manuscripts of the works by classical Persian authors (Hāfiz, Jāmī, Bīdil): Quantitative Analysis of 17th-19th c. Central Asian Copies". Iran: Questions et connaissances. Actes du IVe Congrès Européen des études iraniennes organisé par la Societas Iranologica Europaea, Paris, 6-10 Septembre 1999. vol. II: Périodes médiévale et moderne. [Cahiers de Studia Iranica. 26], M.Szuppe (ed.). Association pour l`avancement des études iraniennes-Peeters Press. Paris-Leiden, 2002, pp. 213–228. ^ a b c Lingwood, Chad (March 2011). "Jami's Salaman va Absal: Political Statements and Mystical Advice Addressed to the Aq Qoyunlu Court of Sultan Ya'qub (d. 896/1490)". Iranian Studies 44 (2): 175–191. ^ Lingwood, Chad (March 2011). "Jami's Salaman va Absal: Political Statements and Mystical Advice Addressed to the Aq Qoyunlu Court of Sultan Ya'qub (d. 896/1490)". Iranian Studies 44 (2): 174–191. ^ "شـرح مـلا جـامـي - Sharh Mulla Jami". Arabicbookshop.net. Retrieved 2014-08-05. ^ Okumuş, Ö. (1993). Molla Cami. In İslam Ansiklopedisi (Vol. 7, pp. 94-99). Türkiye Diyanet Vakfı. His work was used in several schools from Samarqand to Istanbul to Khayrābād in  He was known not only for his poetry, but his theological works and commentary of on culture. 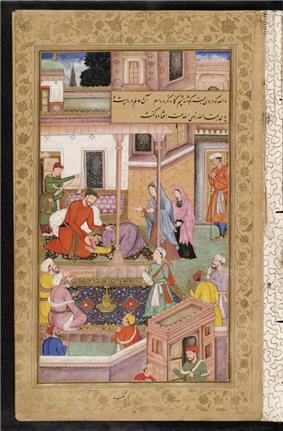 His poetry addressed popular ideas that led to Sufi's and non-Sufi's interest in his work. 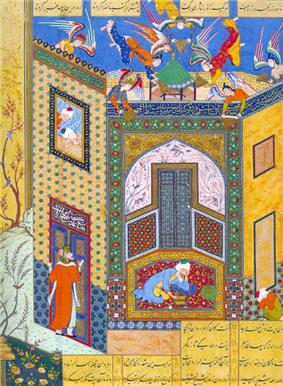 His poetry reflected Persian culture and was popular through Islamic East, Central Asia and the Indian subcontinent. 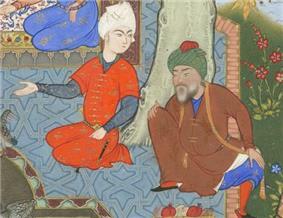 Jami worked within the Tīmūrid court of Herat helping to serve as an interpreter and communicator. After his re-emergence into the social world he became involved in a broad range of social, intellectual and political actives in the cultural center of Herat. He was engaged in the school of Ibn Arabi, greatly enriching, analyzing, and also changing the school or Ibn Arabi. Jami continued to grow in further understanding of God through miraculous visions and feats, hoping to achieve a great awareness of God in the company of one blessed by Him. He believed there were three goals to achieve "permanent presence with God" through ceaselessness and silence, being unaware of one's earthly state, and a constant state of a spiritual guide. Jami wrote about his feeling that God was everywhere and inherently in everything. He also defined key terms related to Sufism including the meaning of sainthood, the saint, the difference between the Sufi and the one still striving on the path, the seekers of blame, various levels of tawhid, and the charismatic feats of the saints. Oftentimes Jami's methodology did not follow the school of Ibn Arabi, like in the issue of mutual dependence between God and his creatures Jami stated "We and Thou are not separate from each other, but we need Thee, whereas Thou doest not need us."